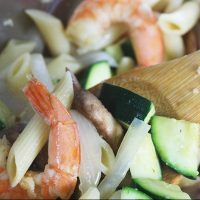 This shrimp zucchini penne is light but packed FULL of flavor. Using Ken's oil and vinegar dressing, and without having to use a cream based sauce, this has to be what I’d consider healthy comfort food. I’ve really been trying to do less, without the family feeling like they’ve gotten slighted on dinner. Hubs recently came home and proclaimed he’s going meatless. And I've been trying to watch what I put in my mouth hoping my waistline will reward me for it. So it only made sense that I go lighter where I can. I don’t like to make sacrifices on flavor and taste in the name of being healthy. Instead, I always step up to the challenge to do things in a different way so that taste isn’t compromised. 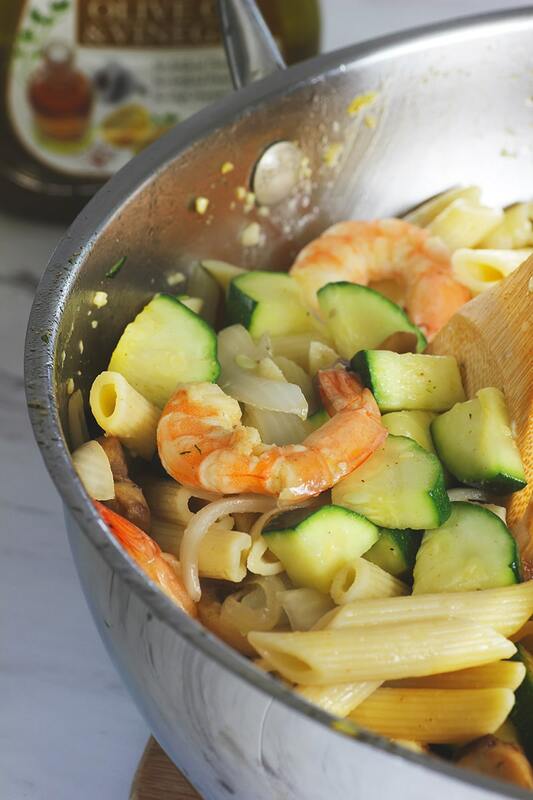 With this shrimp and zucchini penne I pretty much accomplished just that. We normally eat pasta recipes loaded with sauce and such. And while those are yummy too, sometimes you gotta trim somewhere. Like when you stand on the scale and it says mean numbers to you. That’s a good time to trim. I am a complete fan of Ken's dressings. I swear by their poppyseed dressing in my Pecan Strawberry Poppyseed salad. Come to think of it, that salad would be a good starter to this meal if you wanna get in some extra greenery. At any rate, here’s what you came for. Sauce (dressing) served over tender pasta. Everything will be cooked in the same skillet minus the pasta. Have a dish set aside to put the cooked veggies in and move on to the next. Pasta can literally be good with just the noodle and a good sauce. Therefore, you don't need a whole lot of added ingredients to make it completely BANG! Less is truly more. Noodles + Toppings + an amazing sauce is what makes amazing pasta dishes. Experiment with different sauces and toppings for an unlimited amount of variety. You may think that tomato and/or cream based sauces are the only ones that can make pasta yummy. Insert Ken's amazing dressings. While this can totally be used on a salad, it brings a special delight to this pasta dish while keeping it light and tasty. 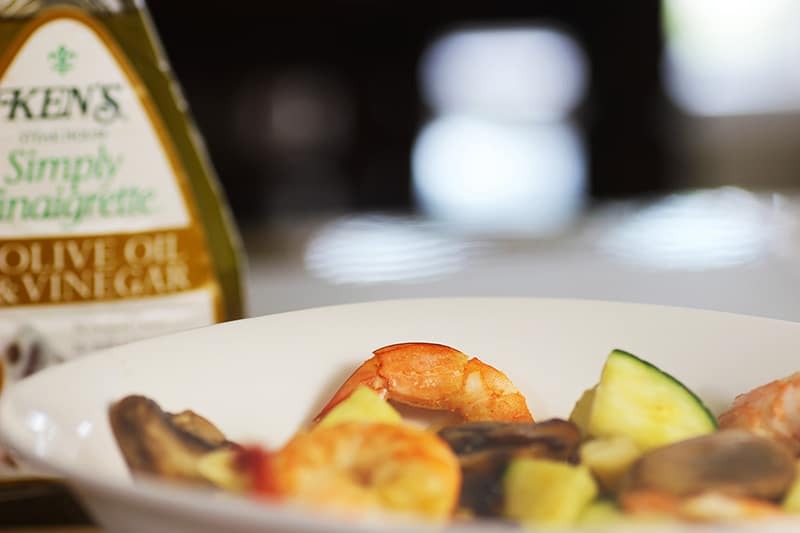 A special thank you to Ken's dressing for sending me this new Oil +Vinegar dressing to try. Add 1 tbsp olive oil to saucepan and heat over medium heat. Add in zucchini and saute, stirring often for roughly 4 minutes, until slightly soft but still crunchy. Remove from skillet and set aside in a dish. Add another tbsp of oil in skillet, heat, and add onions to skillet. Saute until slightly transparent. Remove from skillet and set aside in the dish holding the zucchini. 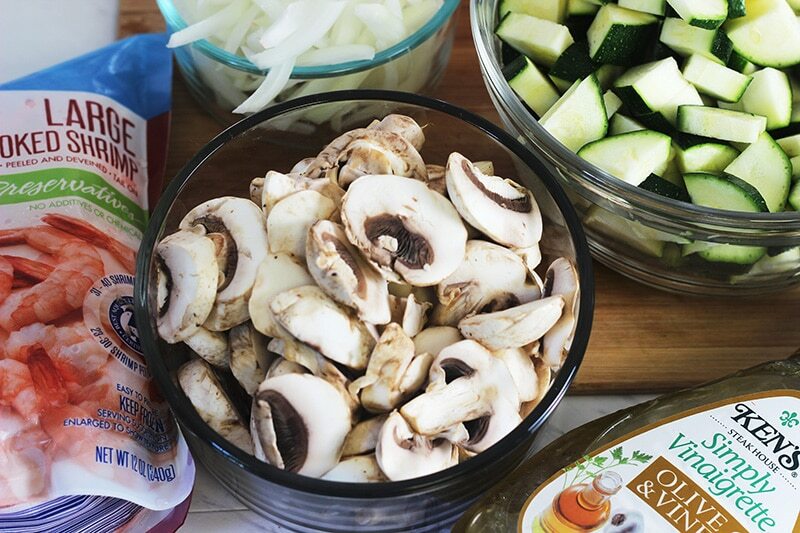 Add another tbsp of oil in skillet, heat, and now add mushrooms to skillet. Saute until slightly soft. Remove from skillet and set aside in the dish holding the onions and zucchini. Add in shrimp to skillet with garlic and Old Bay. Saute until completely heated through. 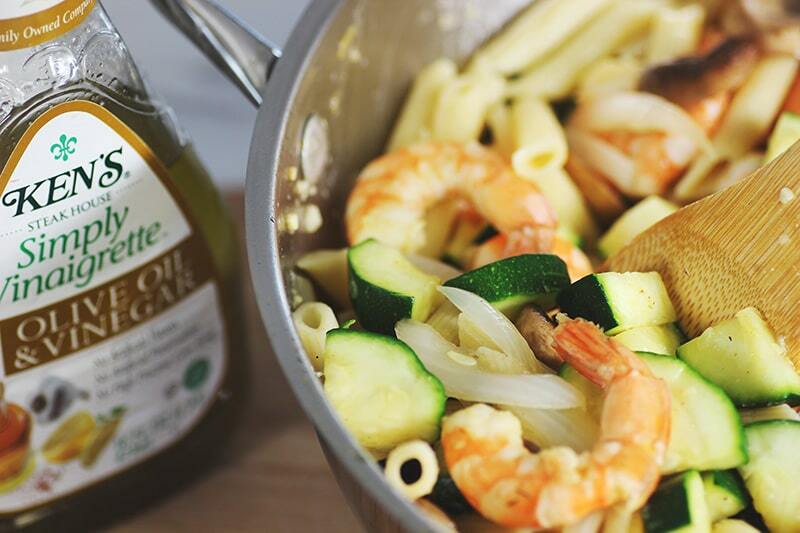 Once finished cooking, remove saucepan with shrimp from heat, add in veggies, cooked pasta, and Ken's dressing. Toss and serve. Sprinkle with grated parmesan for added flavor. I seasoned veggies with seasoning salt and garlic powder when cooking. Season according to taste. 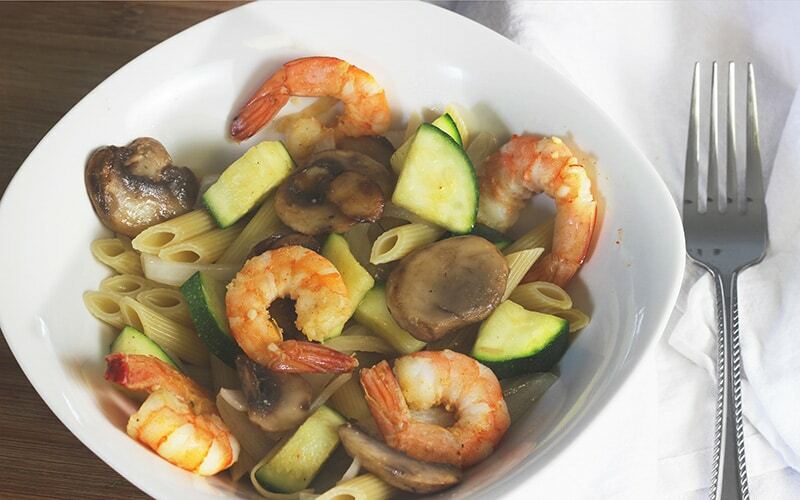 Interested in making Shrimp Zucchini Penne Pasta later. Pin using the button below or tell a friend! Love this…and you! Printed out the pasta recipe so I can make it SOON! Heeey Lisa! I ❤️ you too girl! Let me know how you enjoy it.